lundgaard amplifiers are handbuilt. The individual parts are fabricated by subcontractors. All wood and metal work is done at highly specialized plants in Denmark. The unit price is perhaps higher, but so is the quality. The fact that all processes can be directly supervised, is a big plus, when consistant quality is important. Loudspeakers are supplied by Italian SICA, specialist in neodymium drivers, and a very respected name in the music business. 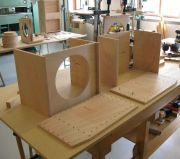 Cabinets are made from lightweight plywood, doweled and glued togehter, using 2 tons pressure force. Later they are sanded, dyed, and laquered 3 times, for a beautiful finish. Expensive production method, but worth it. Power modules are made by IcePower, pioneers in Class D technology. Lundgaard.amps use 3 different modules, all delivering superb audio quality. The advantages of Class D and switchmode powersupply is clear: Max efficiency, low weight and size, stability, and environment friendly green technology. IcePower comply to all international standards regarding safety, radiance and environment. PCB's are filled with components and soldered in Denmark. This enabeles direct supervision of components and solder quality. Opamps are socket mounted. Passive and active components are obtained from suppliers all over the world. All parts are chosen for audio quality, and everything complies with ROHS standards. The parts are collected as a kit and finally put together. 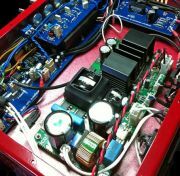 A new amplifier is born. After function testing, using microphone, double bass, electric bass and guitar, the amplifier is ready for shipping.